The policy momentum on digital transformations and the future of work (FoW) is building and is resulting in recommendations at the EU level. This study sets out to outline the different dimensions of the digital transformation on sectors and business models, and hence on the quantity and quality of work. 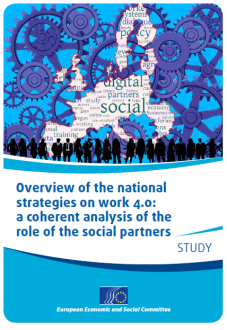 Based on a TUAC member survey, peer-to-peer reviews and in-depth research, the study presents a typology of existing policy processes in Europe, the involvement of trade unions therein (or the lack thereof) and complementary social partner activities that often fill the gaps. The study features best practice examples and case studies on Germany, Austria, Italy, Spain, Sweden, Denmark and the UK.